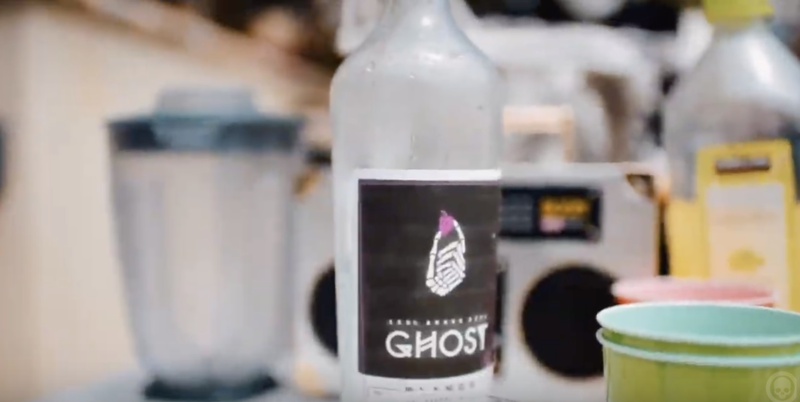 4(a)(6) offering provided by Netcapital Funding Portal, Inc.
Ghost is a 100% agave, premium blanco tequila with a splash of spice, amazing on its own and designed for perfect spicy margaritas. 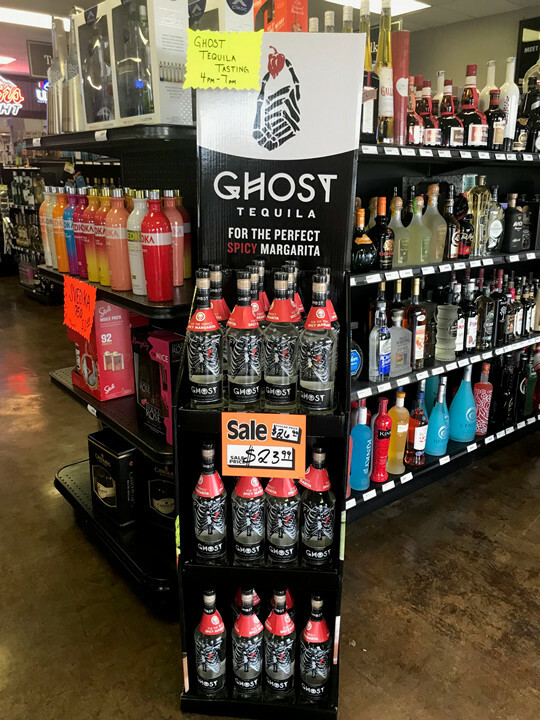 A top 53 tequila brand in two short years, Ghost was made for margarita aficionados, heat lovers, tequila novices and really, anyone looking to spice up their night. The margarita continues to be the US’ favorite cocktail - 60% of spirit drinkers had one in the last week. And while margaritas themselves can be considered an industry, with endless combinations, recipes and variants used, one style in particular has gained enormous traction as a top trending cocktail: the spicy margarita (just ask Adweek, CNBC, Vinepair or Eater, to name a few). As US consumer demand for hot and spicy food continues to grow, spicy margaritas are quickly becoming an industry in and of themselves. 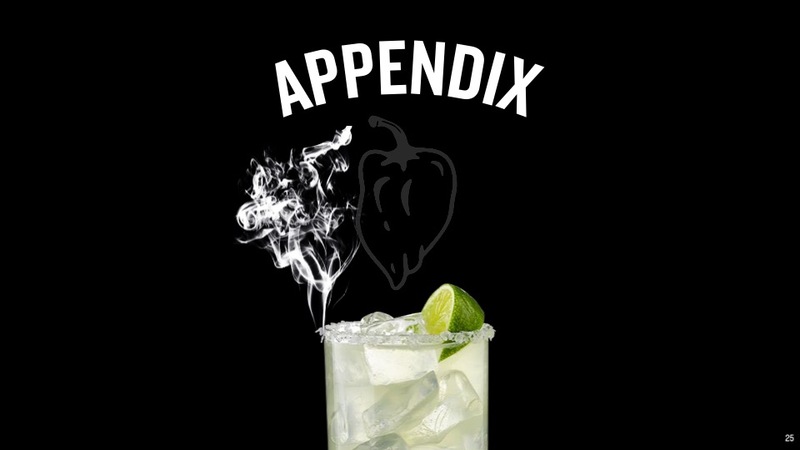 Yet, despite the recent boom in popularity of spicy margaritas and other spicy cocktails, the creation process for bars and restaurants remains largely the same - that is, with no consistent methodology, recipes or call brands. 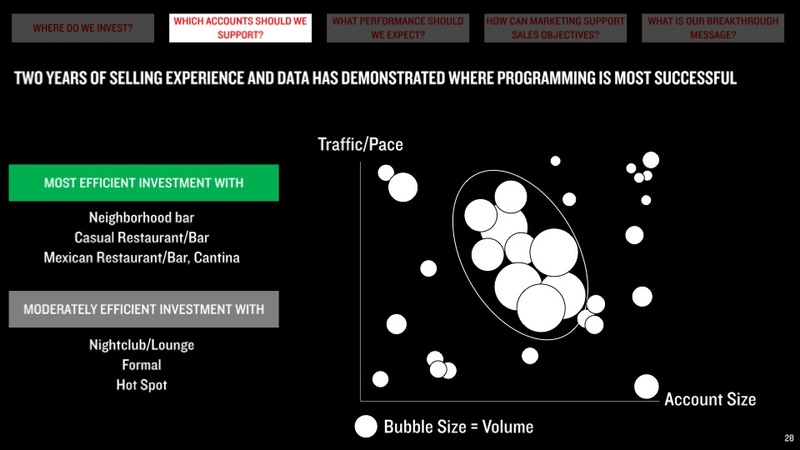 And while no one is knocking experimentation (which admittedly led to our brand), this does present an issue for both the bar and the consumer. Bars invest unnecessary time and money to prepare these drinks, as they purchase peppers, measure, muddle, and try to achieve the same consistency with each drink (hint: it’s nearly impossible). Consumers are in turn subjected to significant variability in terms of the spiciness of their drink - ranging from the undetectable to the downright overwhelming. At home, consumers looking to make their own spicy margaritas or cocktails are left to figure it out for themselves, hoping to land on a decent recipe following a Google search. With no standard or go-to brand in mind, the same consistency issues they’ve likely encountered when sampling spicy margaritas at the bar become further amplified. 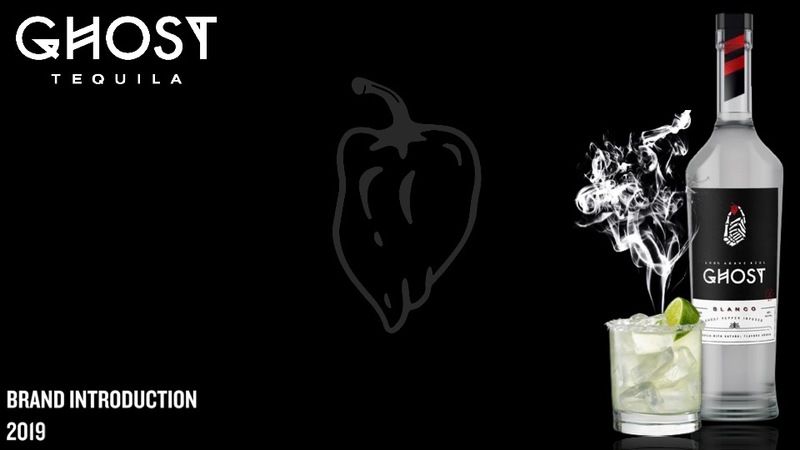 We made Ghost Tequila with the goal of creating a tequila that could stand on its own (no lime, no salt) and also be the standard for spicy margaritas. The brainchild of a Boston-bartender, the idea for Ghost came from a locally popular tequila cocktail that incorporated a trace amount of spiciness and agave nectar. His drink - combining a touch of sweet and heat to offset the traditional tequila burn - was a local hit amongst tequila aficionados and novices alike. This small success indicated a huge market potential, and so Ghost was born. As our first step in bringing Ghost to market, we partnered with the most awarded distillery in Mexico to produce the finest quality 100% agave tequila available. We then worked with a PHD chemist to achieve an approachable and consistent level of spice in each and every bottle, so that the same delicious spiciness encountered in a Boston pub would taste the exact same as a margarita made from home in San Diego. 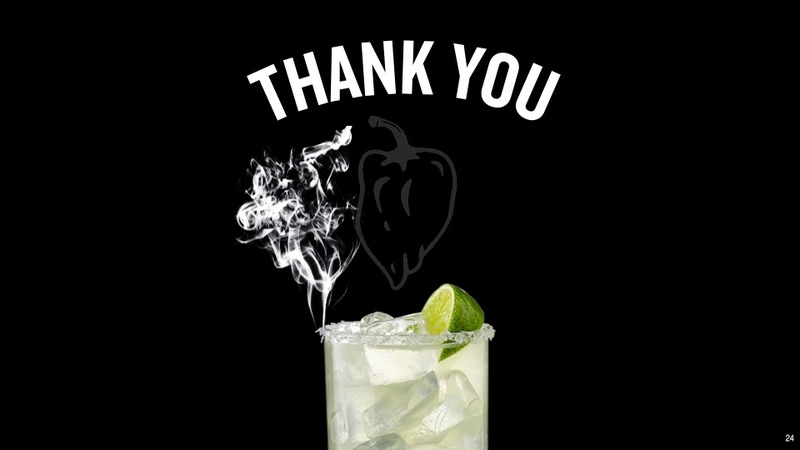 The result was a completely unique taste experience that replaced the traditionally aggressive after-burn of tequila with a mellow heat; a tequila that would streamline the spicy margarita process for bars and render DIY spicy drinks at home a complete no-brainer. No more muddling, no more guesswork, no more scorched mouths. Finally, to compliment this disruptive new product and the hustle that got it to market, we created a brand that celebrates service industry as well as any patron looking for a kick to the classics and an opportunity to embrace their spicy side. Leveraging over $3M in seed investment from prominent angel investors, we turned an at-home experiment into a top 53 national tequila company, selling 5,000 cases in our second year of operation, with 90% of our volume coming from just 3 major markets (Massachusetts, Texas and Southern California). Empowered by a rockstar team of sales professionals, advisors and ambassadors, Ghost is now present in over 3,000 retail locations nationwide with new accounts added to our roster each day. Triple digit sales growth, industry-crushing reorder rates and consumer testimonials underscore the potential of a brand that has hardly scratched the surface. Now, as part of a subsequent and broader investment raise needed to expand our national presence, we’re starting a crowdfund campaign to bring GHOST to the masses. Said another way, you don’t need to be a Clooney anymore to become a part of the next big tequila brand. It should be no surprise that demand for Mexico’s native spirit has been nothing short of insatiable. Exports of pure tequila from Mexico to the United States are up 198% in the past decade (source: Forbes). Just this past year, Tequila exports to the U.S. increased 7% to 20.4 million cases in 2018, according to recently released statistics from the Consejo Regulador del Tequila. The 100%-agave segment continues to drive growth, with its exports to the U.S. rising 15% last year to 11.7 million cases, accounting for over 57% of all Tequila shipments. As recently as 2010, 100%-agave shipments to the U.S. had only a 38% share of the category (Shanken). And the buzz around the liquor, made from the blue agave plant, doesn’t appear to be slowing. Celebrities like George Clooney, Diddy, Justin Timberlake - even the Backstreet Boys - have jumped into the tequila-making business. And large companies like Diageo, Pernod Ricard and Constellation are eagerly snapping up tequila makers. In April, rum giant Bacardi completed its acquisition of Patrón tequila in what was among the largest liquor deals in recent years. Bacardi had owned a 30% stake in Patrón Spirits International for nearly a decade, and decided to buy the remainder. Patrón was valued at $5.1 billion in the acquisition. 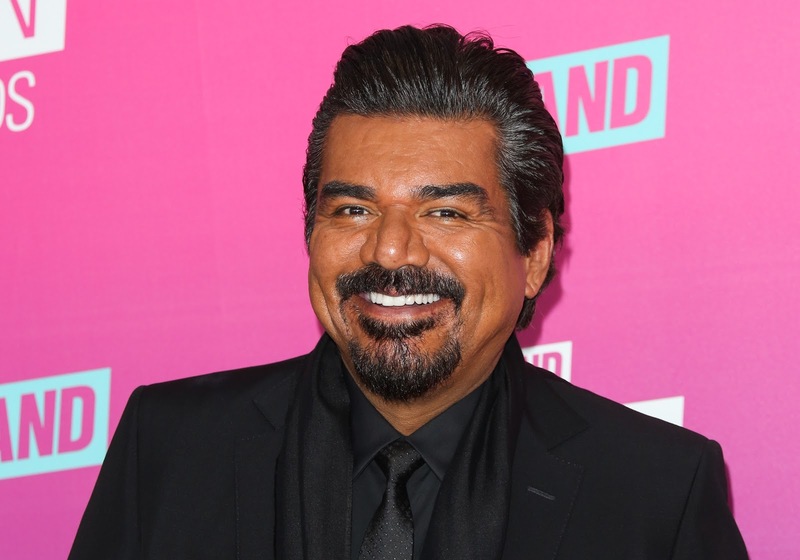 Meanwhile, last year, Diageo agreed to pay up to $1 billion to buy the fast-growing tequila brand Casamigos, which was founded in 2013 by actor George Clooney and two other business partners. Tequila’s most popular format is none other than the Margarita, which was America’s highest selling cocktail for the last two years in a row (source: Nielsen). In a relatively recent survey conducted by Nielsen, 51% of respondents ranked the Margarita as their favorite cocktail. The same survey found that 60% of on-premise spirit drinkers in the US had at least one. Approximately 1 million margaritas are made every day, and comprise a $4.0 billion dollar industry. While there is plenty of opportunity and growth within the Tequila and margarita categories, there is also an undeniable amount of competition. However, our key product differentiator (clean, consistent and delicious spice) offers insulation from competitive pressure as we focus almost exclusively on being the number one Tequila for spicy margaritas and spicy Tequila cocktails. Our decision to infuse 100% agave tequila with spice was far from arbitrary, and in part was based on the observation of the growing prominence of hot and spicy foods in US culture. 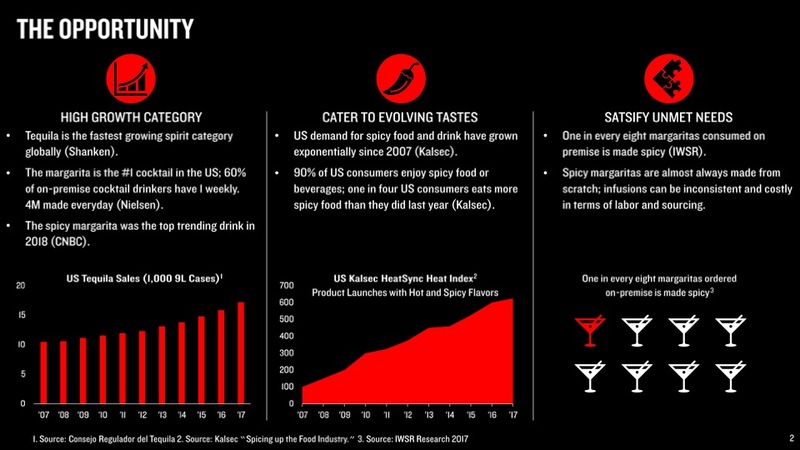 According to Kalsec, the world’s foremost authority on spicy cuisine, 90% of US consumers enjoy hot and spicy food, with 1 in 4 consumers eating spicy foods more often than they did a year ago. As spiciness continues to play a dominant role in what we eat and drink, we too expect spicy margaritas to play an increasingly dominant role on cocktail menus nationwide. Already the favorite drink of Virginians in 2018, the spicy margarita has been mentioned by top publications as a top trending drink of the year (Adweek). 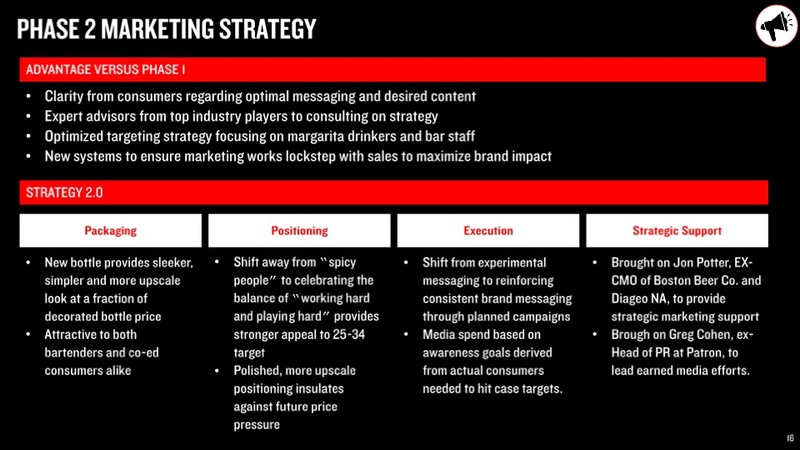 The current white space in the market for a spicy margarita call brand signals a significant opportunity for us based on our flavor profile alone. 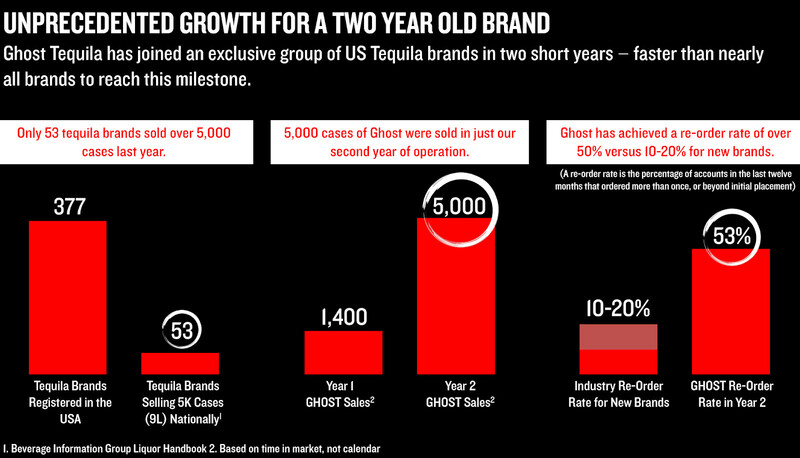 Factoring in our branding, team, operational expertise and sales and marketing strategy, we expect to grow Ghost Tequila to a 100K case brand with 4 years. 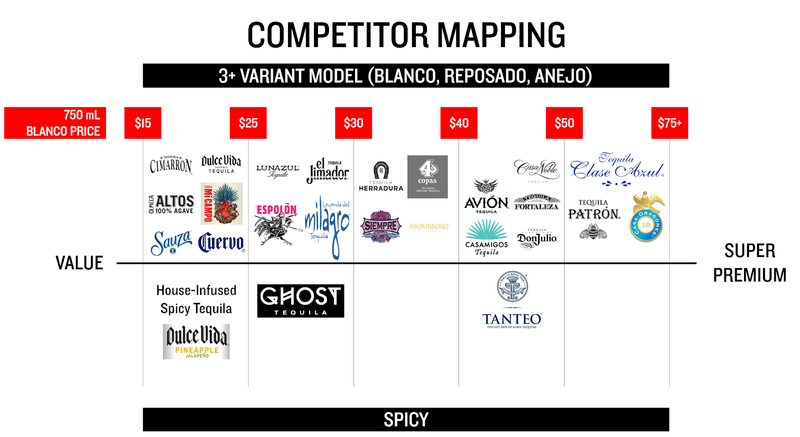 The majority of major tequila players in market utilize a blanco, reposado and anejo model. 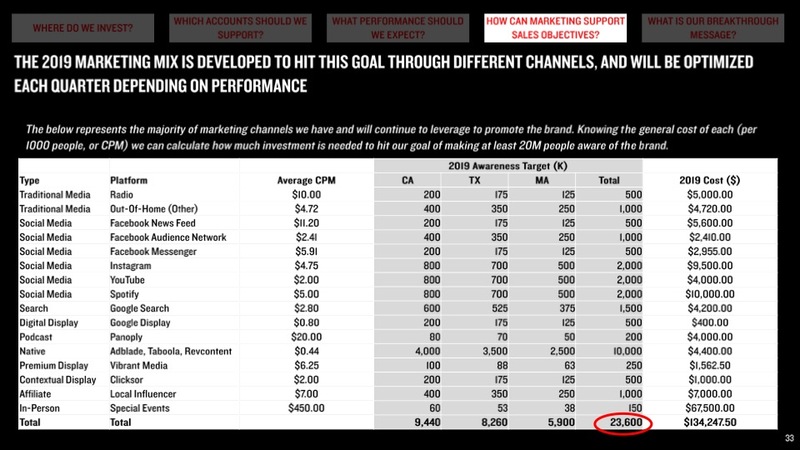 Brands with this model occupy all price tiers from value ($15-25) to premium ($50-$75). 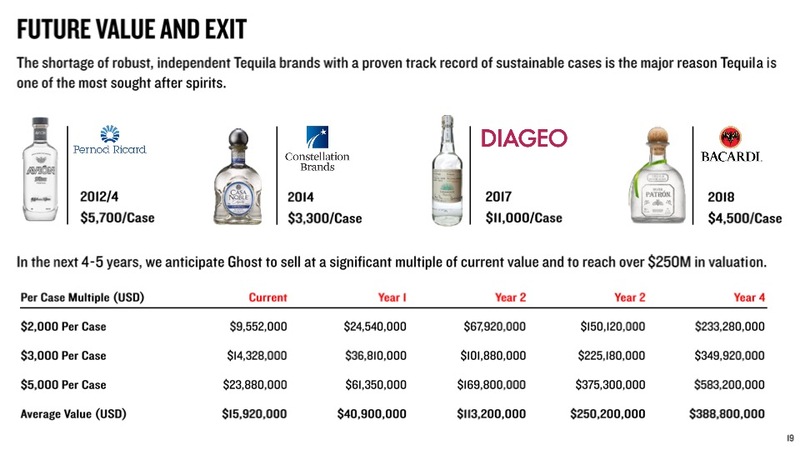 No major tequila player operates with a single SKU or with their lead brand being a flavored/spicy variety - aside from Ghost Tequila. Aside from Ghost, the only significant players in the 100% agave spicy tequila sub-category are house-infused spicy tequila, Tanteo Tequila, and one spicy offering from Dulce Vida Tequila. 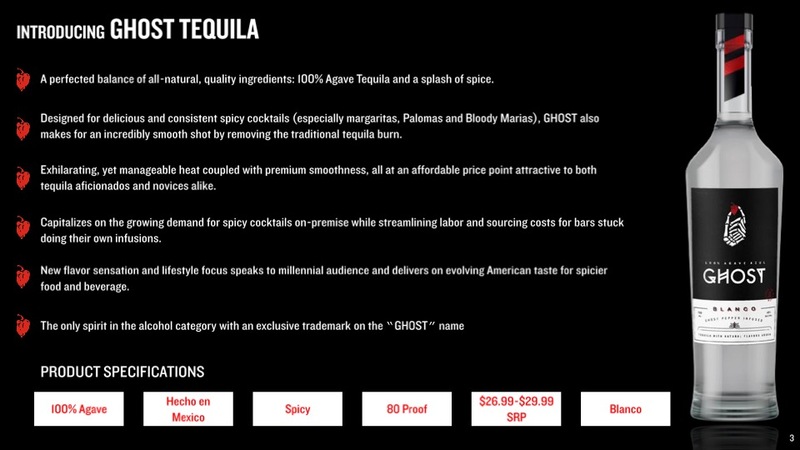 Given our price point, house-made spicy Tequila is our nearest in competitor, however, Ghost was designed specifically to replace this option as it provides greater consistency at scale for any bar serving spicy tequila cocktails. 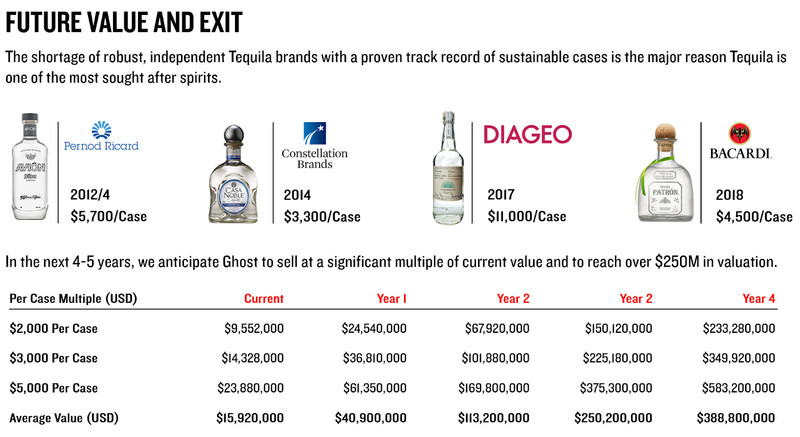 Ghost Tequila is required to sell through a federally regulated supply chain, known as the three-tier system, and lawfully uses this system to carry out the retail availability and home delivery of its product. The Three Tier System is a federally regulated supply chain requiring that all alcoholic producers sell their products to a licensed wholesaler, who in turn must sell to a licensed retailer, who in turn are able to sell to consumers. 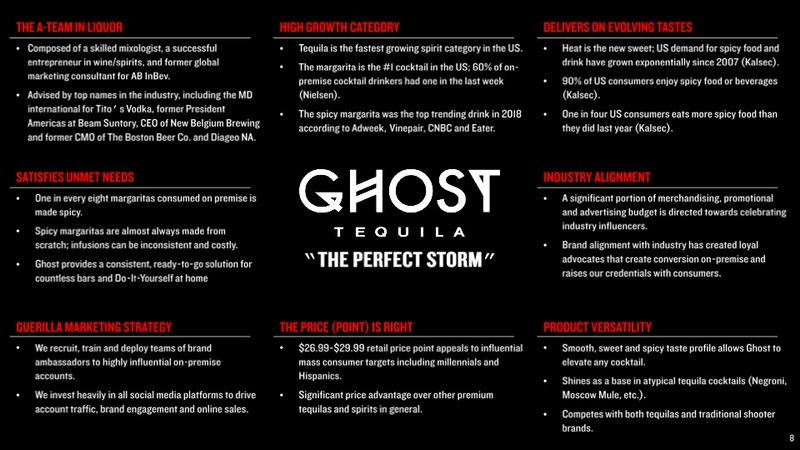 So while consumers are the end users of our tequila, Ghost actually generates revenue through product sales to distributors. 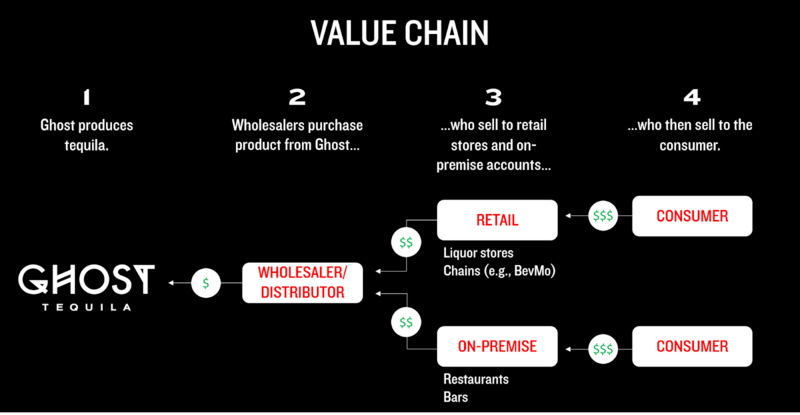 Distributors place orders with suppliers, like Ghost, based on 1) growth estimates and 2) demand from retail accounts (e.g., liquor stores) and on-premise accounts (e.g., restaurants, neighborhood bars). Retail and on-premise accounts order from the wholesaler for multiple reasons, most usually because a brand 1) fulfills a specific product need 2) provides the right value for cost or 3) satisfies consumer demand (e.g., people ask for it). 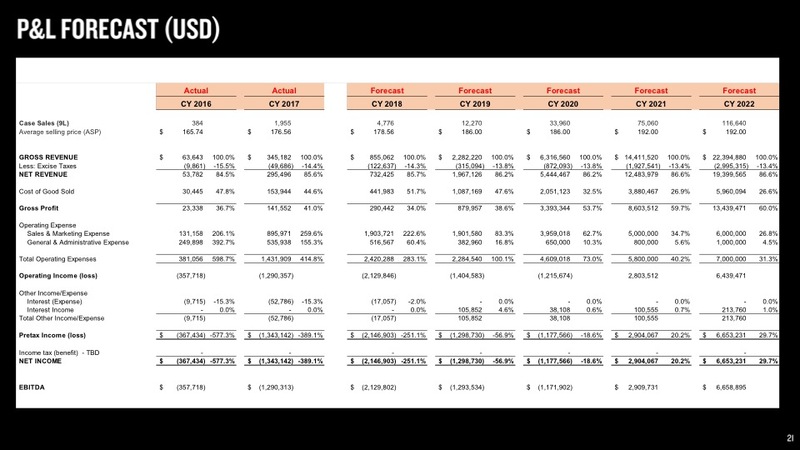 While we directly earn revenue from licensed wholesalers, our success is based on the demand we generate across each tranche of the three-tiered system (wholesaler, retailer, consumer); each tranche requires a different marketing, sales and outreach strategy in order to optimize earnings potential. 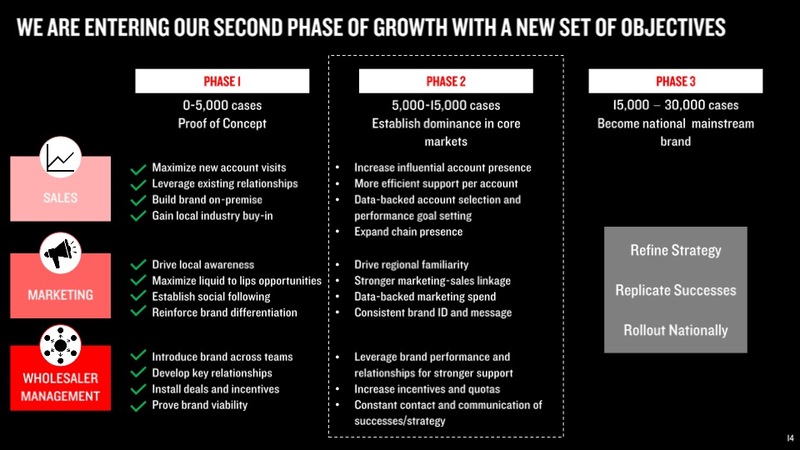 Typically, the more popular a brand becomes over time, the greater its ability to impact higher levels of the value chain. A small brand has the ability to speak directly to and sample new consumers without many obstacles. 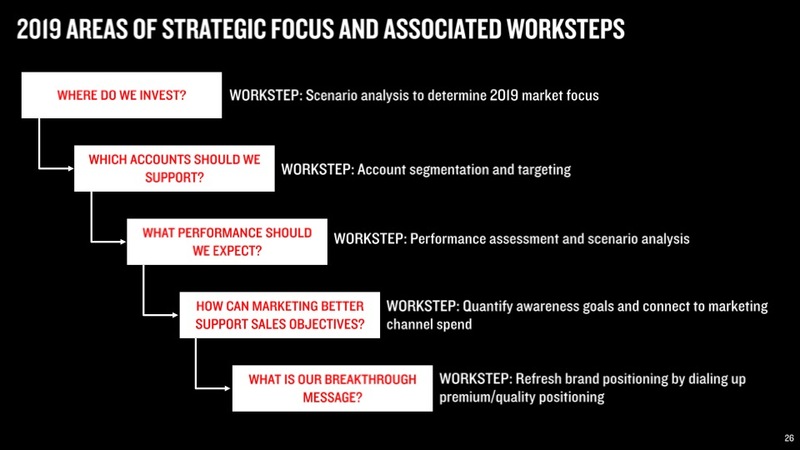 Over time, and once a certain amount of consumer demand is present, retailers begin to take notice and order the product with less significant account-based sales and marketing investment needed to impact decision-making. When enough brand saturation has occurred in retail environments, wholesalers begin to take notice and provide more resources by way of representative support and significant inventory purchases to flood the market with the brand. This phenomenon underscores the important of social proof as it relates to product purchase, as wholesalers and accounts need assurances that there is enough demand to justify the risk of purchasing a given amount of product. 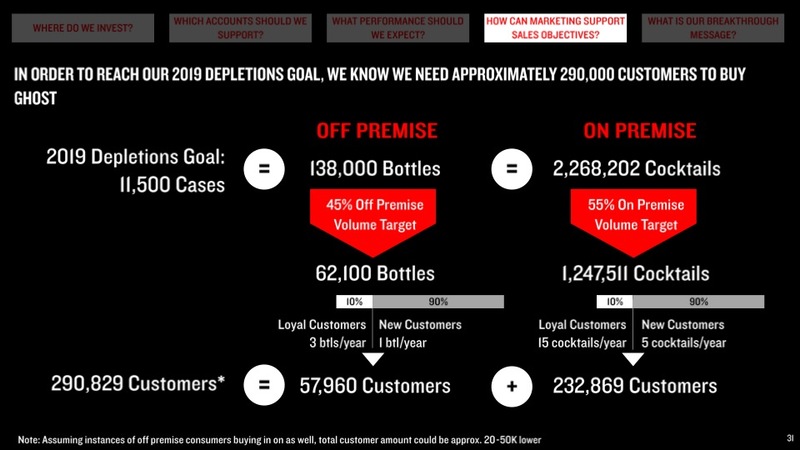 Customer acquisition and revenue growth in the world of alcoholic spirits relies on a tailored marketing, sales and outreach strategy for each tranche of the three tier system. Due to the legal enforcement of this system, no spirits brands can credibly grow by neglecting any one tranche (for instance, by selling direct to consumer from their own warehouses, thereby cutting out the wholesaler and retailer). Having to play within the bounds of this system presents a serious obstacle for new brands that have not found a way to navigate within the respective battlegrounds of the wholesaler and account arenas. Larger brands can present larger incentives and resources than smaller brands to occupy the attention of wholesalers, and have the distribution, event budget and ad spend to maintain strong awareness amongst retailers and consumers. 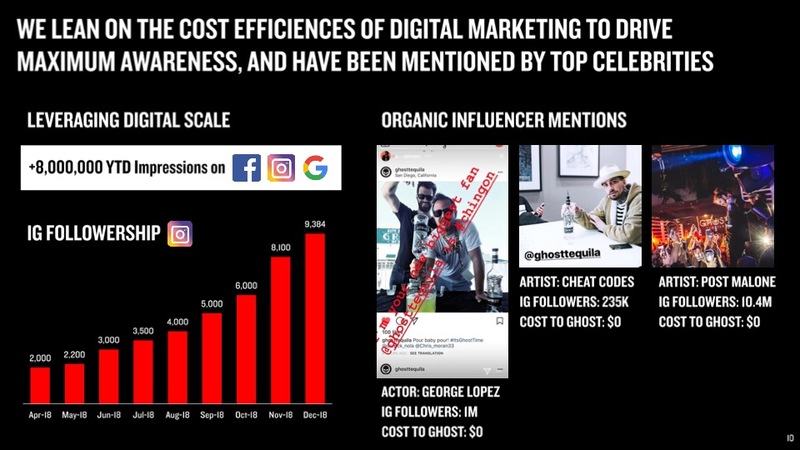 And while this is no doubt a challenge, Ghost is intentionally and uniquely positioned to cater to all three of these audiences by way of our product, brand, tactics and organization. Our customer acquisition strategy relies on many different tactics, but ultimately our goal is simple: to increase meaningful consumer awareness, trial and loyalty. 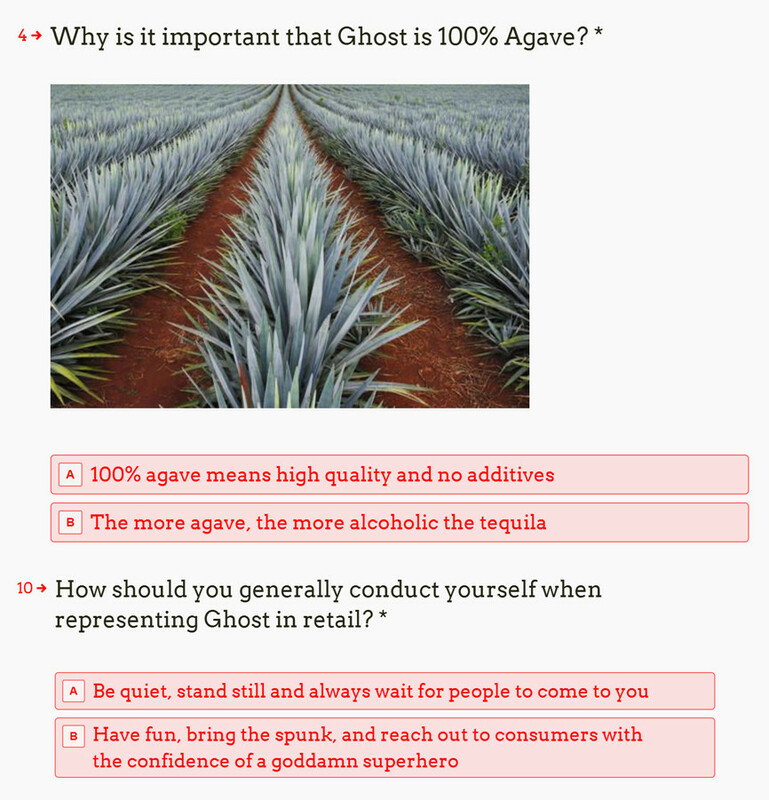 As a completely unique product that fulfills a real need amongst margarita lovers and tequila drinkers, our core messaging strategy is to increase the awareness that our brand/product exists and comprehension of what it delivers. Unlike launching a new brand in vodka, rum, whiskey (to name a few), we are launching a brand in an almost completely undefined category: 100% agave spicy tequila. It’s for this reason we do not consider the exorbitant list of 3-variant (blanco, reposado, anejo) tequilas a meaningful part of our competition. One would be hard pressed to walk into any tequila bar (or any cocktail bar, for that matter) and not see a spicy margarita or tequila cocktail on menu. In many instances, consumers don’t feel the need to ask for a specific brand when ordering these drinks because no brand - before us - has made the attempt to claim the category. Whereas a Casamigos or a Patron may be featured in a spicy margarita or include a recipe in their website/advertising, the spicy margarita is our chief focus in marketing, public relations and every form of consumer outreach. The widespread popularity of the cocktail underscores its incumbent demand, which means we have a built in audience of consumers that simply need to understand we exist. 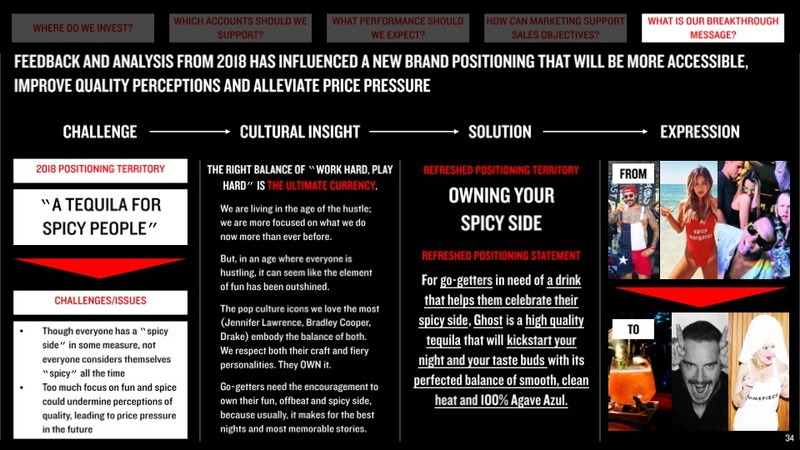 Beyond communicating our product benefits, we’ve built a youthful, fun and modern brand to complement this disruptive category entrant, which is intended to further drive customer loyalty and migrate broader, less-specific audiences (tequila drinkers, spicy food lovers, millennials) into the fold. Beyond simply crafting and executing on-point messaging to attract consumers, we rely heavily on bartender outreach to cultivate brand ambassadorship at the point of purchase. Our motto is “born in a bar, not a boardroom,” which speaks to how we were founded and our promise to celebrate the service industry people and mentality that make it possible for nightlife to exist. 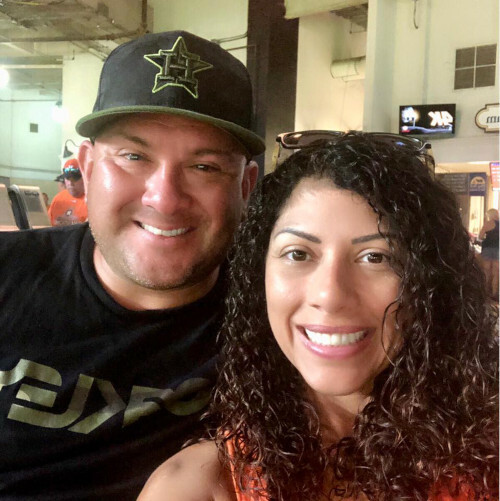 Our bartender outreach efforts include featuring these professionals in our digital content, conducting staff education sessions, and providing a high touch sales mentality that large suppliers simply do not provide. Part of our success in this aspect of our strategy has to do with hiring sales professionals that have either or are currently working in the bar industry. The other part of it is a conscious and authentic focus on their needs, ways of working and respect for their time. Advertising: Digital (PPC, Display, Advertorial, Native, etc. ), Paid/Organic Social, Influencer, Radio, Podcast, OOH. Ambassador Program: Hiring bartenders and consumer advocates as part time ambassadors to provide bar spends and generate social content. Bartender Outreach Program: Creating a high touch relationship between Ghost sales professionals and bartenders, and celebrating bartenders through social content, events, etc. Public Relations: Leveraging the expertise and skill of our in-house public relations consultant (Greg Cohen, formerly of Patrón) to advise on communication and press outreach strategy. Events: Identifying and taking part in brand-aligned events (taco, tequila, margarita, spicy food and music festivals) that allow for direct consumer contact and sampling while driving home the product and brand messaging. Sampling Programs: Employing staffing agencies to set up sampling promotions at liquor stores and on-premise accounts within core markets. Targeted Account Distribution: Identifying the right accounts to sell the product through, based on consumer and brand alignment (e.g., a cantina will usually make a stronger fit than an Irish pub). Targeted account distribution has the additional benefit of eliminating wasteful allocation of marketing and sales resources where chance of opportunity is low. Merchandise: A substantial amount of our marketing budget is allocated towards high quality merchandise for bartenders and consumers who demonstrate an excitement about the brand. Anecdotally, our merchandise has been described as the best in the industry because of its quality and wearability. Merchandise not only strengthens consumer loyalty but gives an additional boost in advertising. 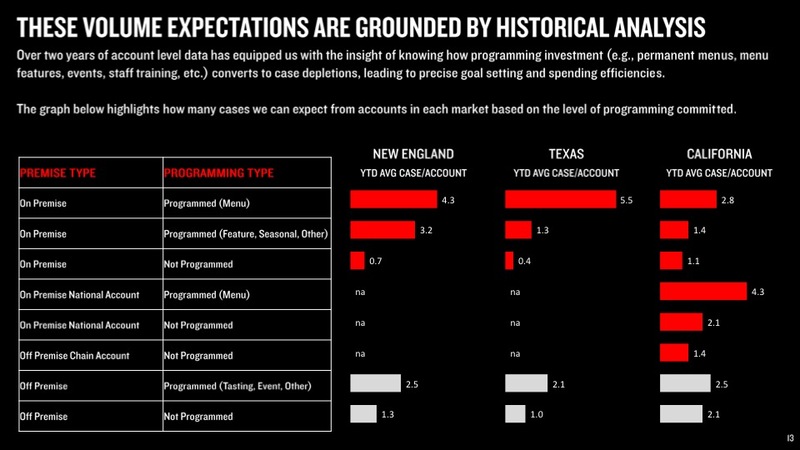 Without account distribution, it won’t matter how successful a brand’s marketing efforts towards consumers are. 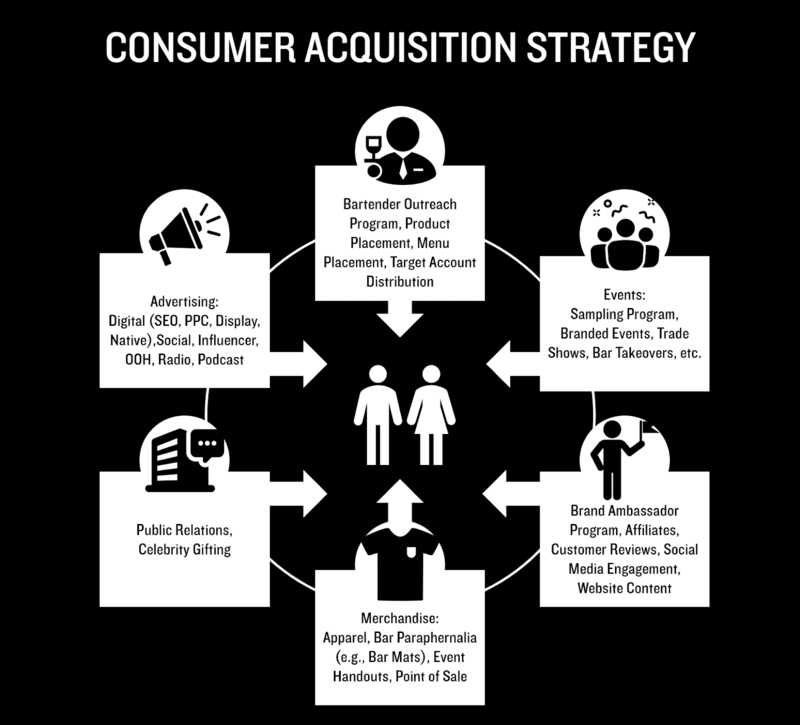 Therefore a key strategic pillar in our customer acquisition philosophy is creating demand amongst retailers to drive product, feature and menu placements - along with generating word of mouth and trial through recommendations. 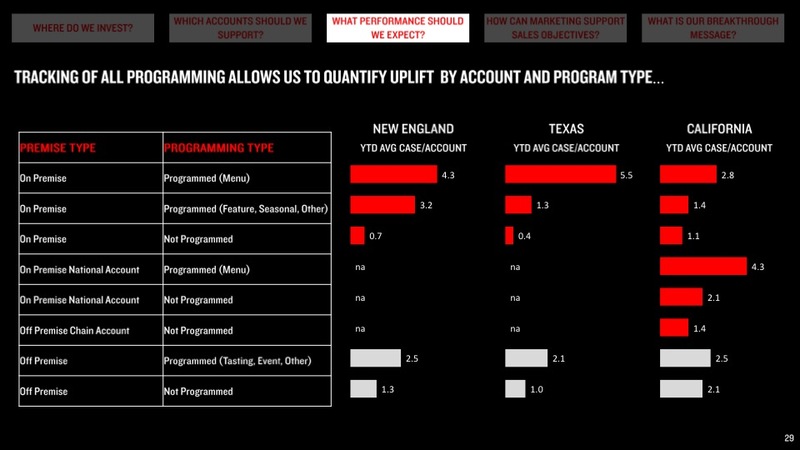 Successful account outreach starts internally. As a brand started by a bartender that intentionally hires sales and marketing professionals with industry experience, our company has a unique advantage in striking authentic relationships with the gatekeepers of the nightlife that allows us to create an on-premise presence that would rival that of a much larger brand. By hiring industry, we also leverage built-in networks in our various local markets that provide easier sell-through opportunities and stronger brand loyalty. Additional outreach initiatives such as handing out merchandise (shirts, hats, branded barware), providing staff education sessions and offering opportunities for inclusion in our social content help to celebrate bartenders while also providing for greater consumer impact. Relationships aside, we also understand the importance of analytics. 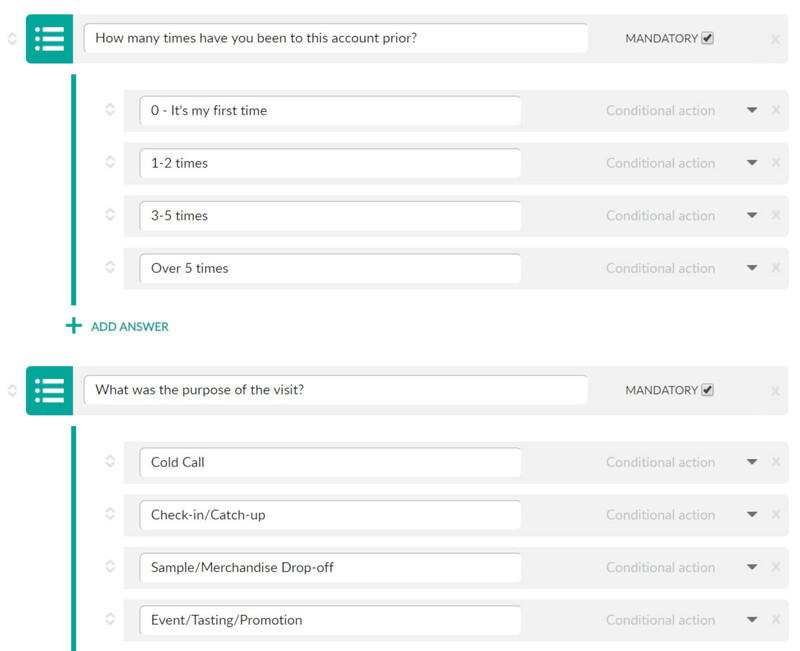 With a high touch mentality, we record all sales visits on a CRM platform (Repsly) to keep up to date on meeting outcomes and future visits, logging details such as person met, date, time, discussions had, programming in place and notes for future visits. 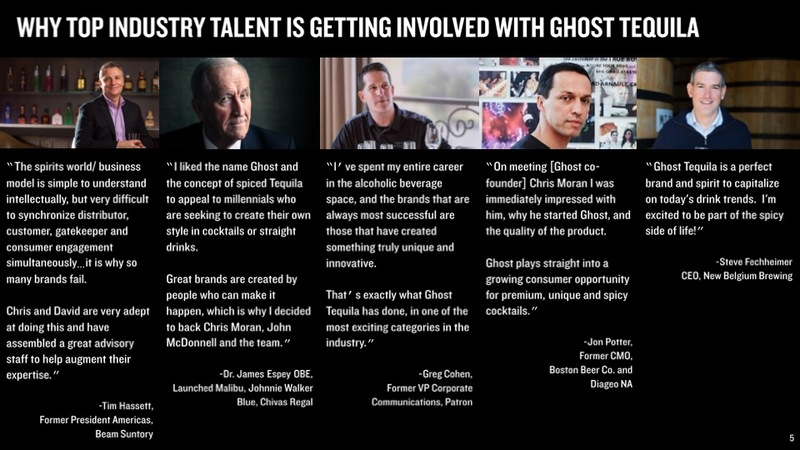 All of these efforts culminate in strong brand presence and bartenders providing genuine recommendations to consumers about “the Ghost margarita” and other Ghost-inspired cocktails, whether they be on or off menu. Off-premise, such as in liquor stores, we leverage in-person sales visits, features and partnerships with trade publications, social media marketing, and public relations to spread awareness amongst owners and operators. Promotional efforts, such as display material (branded shelf placards, case displays, etc.) and sampling programs are well-received by retail owners as they demonstrate a strong commitment from Ghost to educate consumers and move product. To ensure that any promotional person hired to sample the product acts as a responsible and engaging steward of the brand, we require a 100% pass rate on brand quizzes before any sampling is conducted. Quizzes are based on educational retail handouts provided in advance to promotional subcontracted employees. Beyond independent bars, restaurants and liquor stores, we’ve also seen tremendous success with chain stores, both on and off premise. 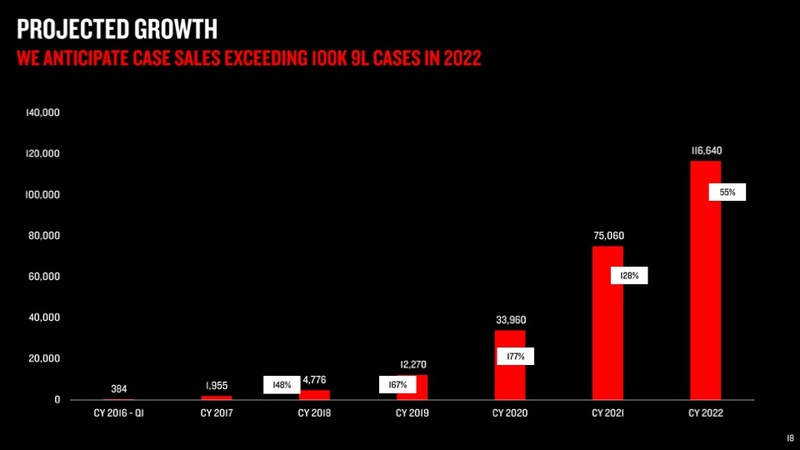 Chain locations are the holy grail for any young brand as they almost overnight extend our geographic footprint and, following a successful pilot period, a steady number of case depletions each month. At the time of this writing, we’ve seen success in massive off premise chains as BevMo, Total Wine and Spirits and Whole Foods. On premise, we are currently focused on expanding our relationship with chains such as AppleBees, Marriott, Cinemark, House of Blues, W Hotels, Hilton and Harrah’s. The wholesaler makes it possible for retail accounts to sell alcohol and consumers to buy it. Working with an established wholesaler comes with numerous benefits, including enhanced coverage (of accounts), scale (of representatives working on behalf of a brand), and experience. Bigger is better when selecting wholesalers to work with; the majority of retail accounts in major markets choose to work with the largest players due to speed, ease and routine. Alcoholic beverage wholesalers make money by reselling brands they’ve purchased for a higher markup to retail and on-premise accounts, who in turn sell to consumers for a higher margin. Portfolios tend to be vast, covering all alcoholic beverage categories, price points and brand sizes. Two predominant functions of the wholesaler relate to product warehousing and product sales. 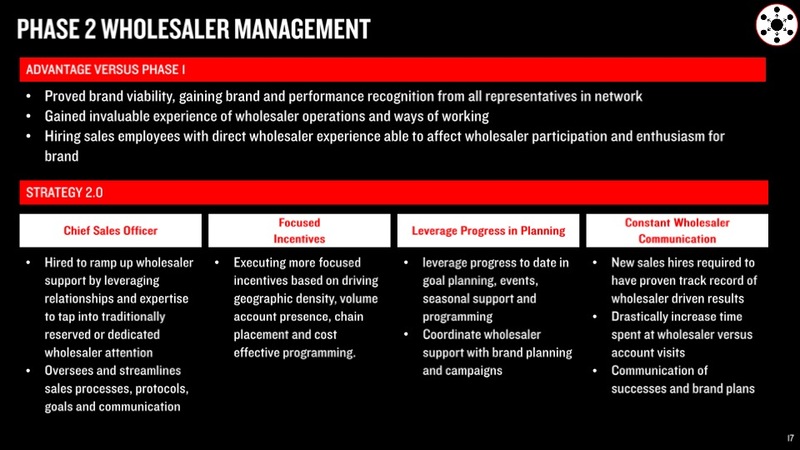 In order to sell product, wholesalers rely on teams of representatives who visit accounts, meet with decision-makers (such as a beverage director) and take orders. The more popular a brand is, the more willing a wholesaler is likely to devote resources in support of selling the brand. Conversely, the more unproven a brand is, the less likely a wholesaler is to pay attention. This simple fact is one of the main suspects behind why many startup brands fail. When we first started Ghost, we largely had to rely on ourselves to introduce our product to retailers. As an unproven brand, we lacked a strong incentive for wholesaler representatives to keep us top of mind on their daily visits to new accounts, despite how intrigued they were about our proposition and opportunity. 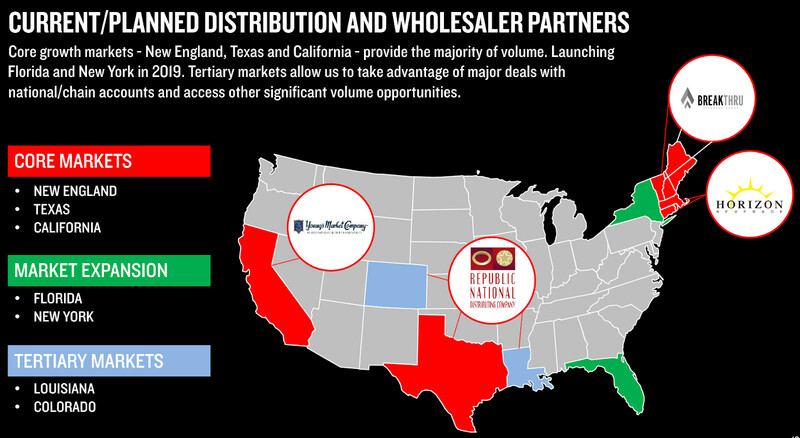 With minimal wholesaler support, we managed to secure over a 1000 accounts between Massachusetts and Louisiana by simply knocking down doors, leveraging relationships and staying hungry. 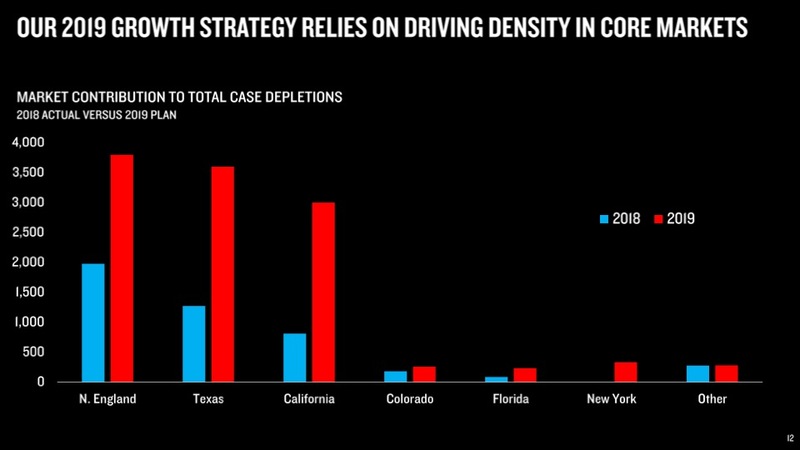 These efforts translated to over 1,400 case depletions - a feat many wholesalers representatives didn’t believe was possible. In our second year of operations, the situation changed drastically. 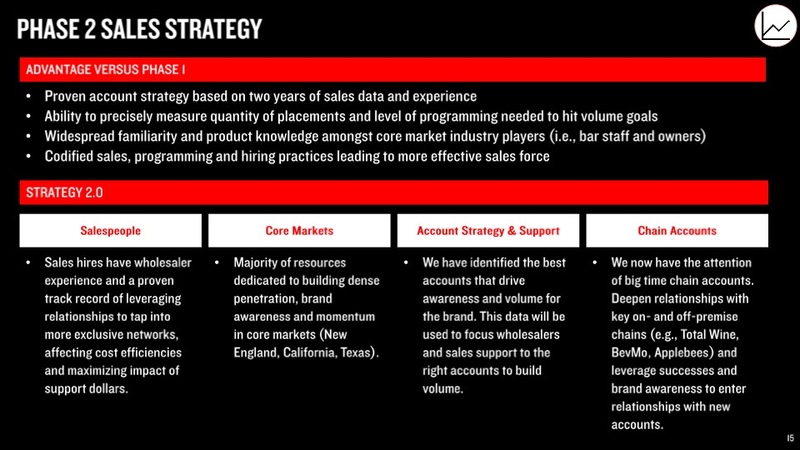 Proof points such as Year 1 sales, account requests for product, word on the street and brand awareness from events and digital advertising eventually got the attention of our wholesaler partners, who started to dedicate significant resources to selling the brand into their respective account circuits. 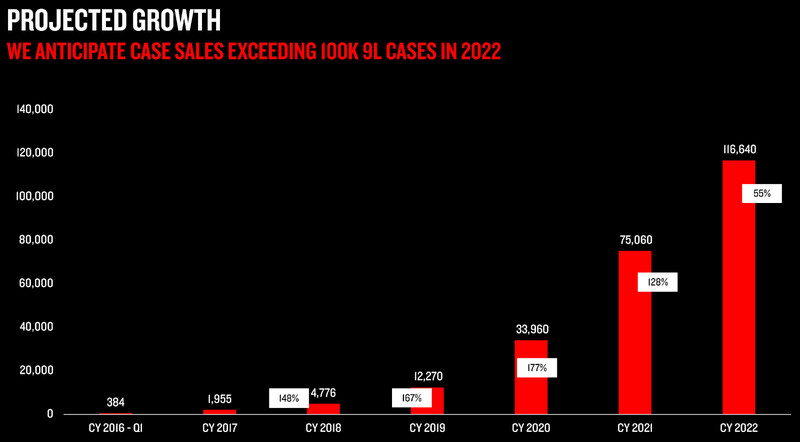 Additional tools such as wholesaler incentives, brand presentations, case deals (the deals wholesaler reps are able to offer accounts based on larger orders) all helped to propel our brand momentum, resulting in 5,000 case depletions in our second year. 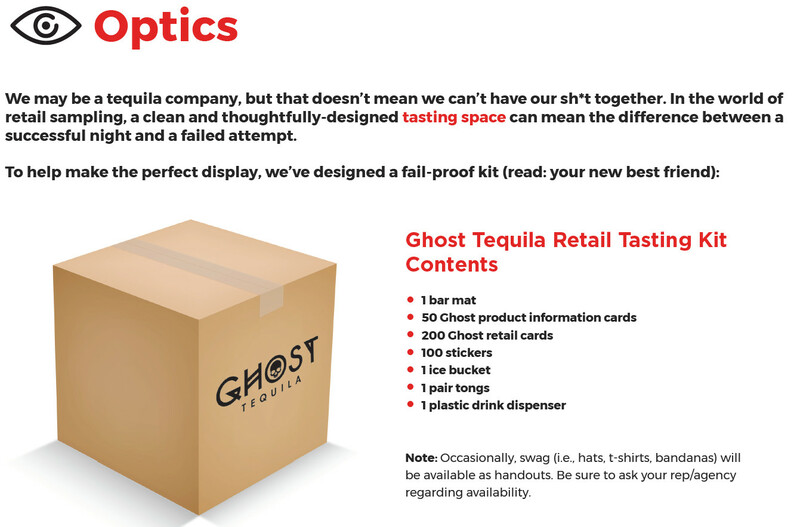 In our major markets, we had provided proof of concept - Ghost was a viable, thriving brand that had not only converted consumers and won over the bars, but proved itself to be a lucrative, dependable part of a wholesalers portfolio. 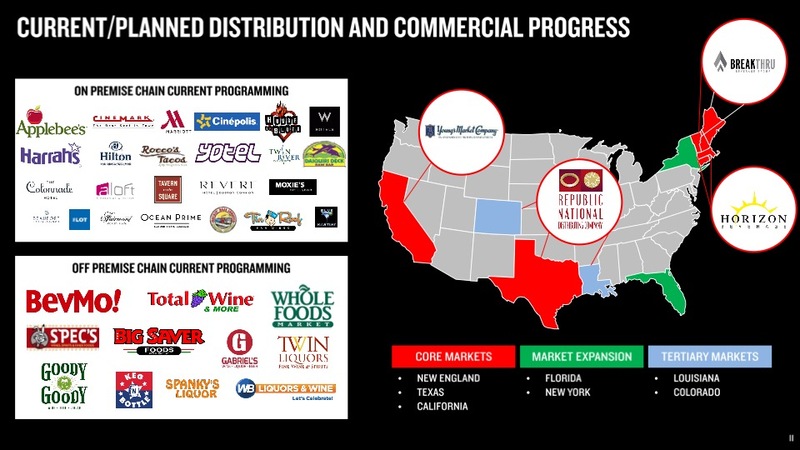 Going forward, we expect to leverage our past successes, experience and brand momentum to drive even greater relationships and results with our wholesaler partners (RNDC in TX, Young’s in CA, Horizon in MA). A newly committed Chief Sales Officer, with experience running national sales for some of the nation’s largest tequila brands, will further ramp up wholesaler support by leveraging relationships and expertise to free up resources and inspire representative action. 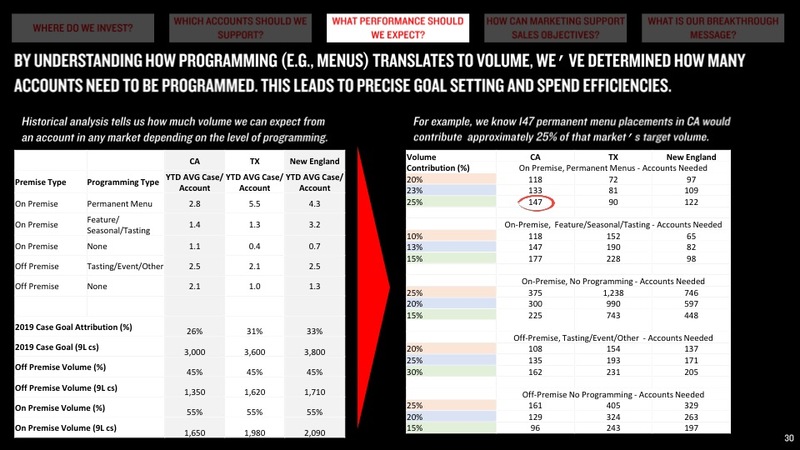 Focused incentive programs will drive account density, presence in high volume accounts, chain account placement and cost effective programming. Renewed internal protocol will enforce constant communication between GHOST sales and external wholesaler representatives regarding goal planning, seasonal support and brand campaigns. New planned hires also have proven experience working with and within wholesaler organizations, eliminating training time and reducing investment in new relationships. 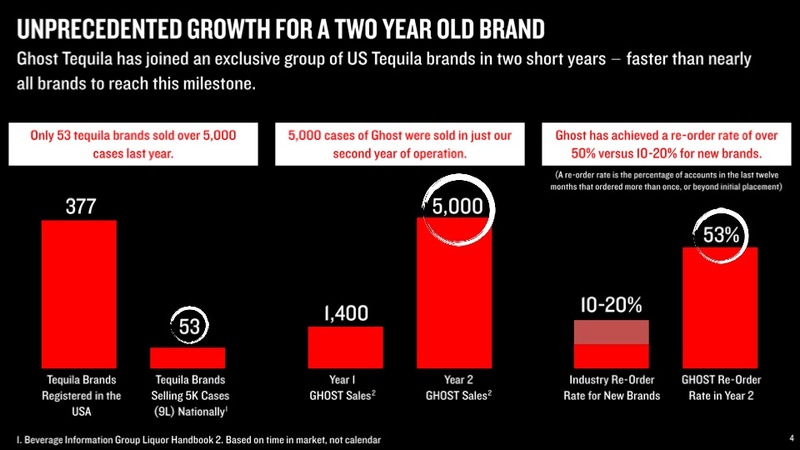 Sold 5,000 cases in second year of operations (as of Oct 18), equivalent to 1,000,000 Ghost cocktails drinks, making Ghost a top 53 national tequila brand in two short years. Raised $3M from reputable angel investors to fund the early stages of the company, including product development, sales and marketing payroll, programming, advertising and event execution. Saw 120% depletion growth, 160% sales growth, and 53% reorder rate (vs. 10-20% average for new brands) in second year of operation (as of Oct 18). Won numerous awards including gold at Los Angeles 2018 International Spirits Competition, Top Taco, Tequila Aficionado, Zestfest and Silver at The SIP Awards, the only internationally recognized consumer judging spirits competition. 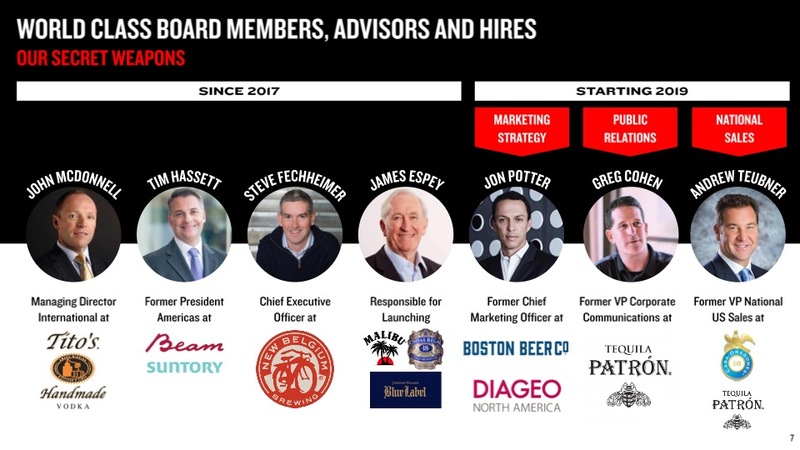 Attracted some of the best industry veterans as advisors including Tim Hassett, the ex president of Beam Americas, Steve Fechheimer, ex head of Global Strategy for Beam/Suntory and Jon Potter who held CMO roles with Diageo, Moet Hennessy, and most recently Boston Beer. 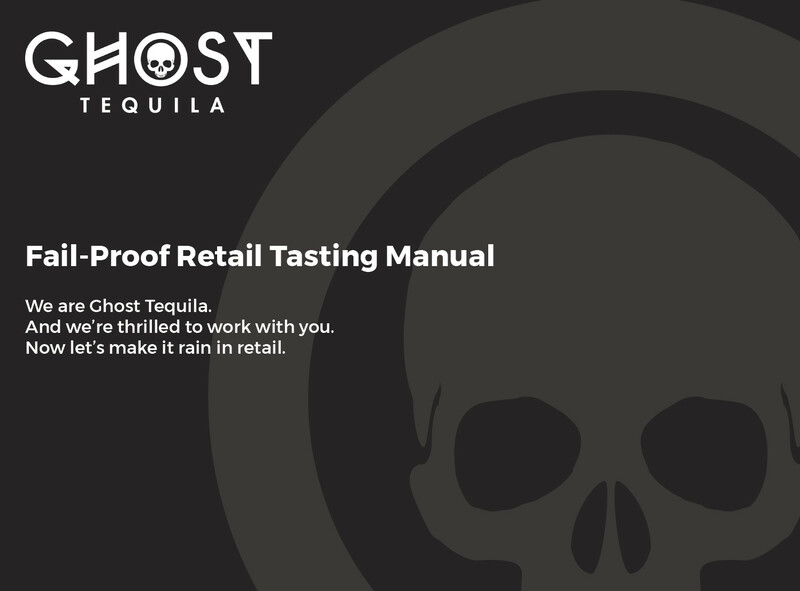 The team behind Ghost came together to achieve a common goal: create the next great tequila brand, accessible to everyone. Respectively, they are a skilled mixologist, a successful entrepreneur in the wine and spirits industry, an ex-global marketer for the world’s largest alcohol company, and top tier financial industry veteran with over 40 years experience. Collectively, they are the A-Team of the liquor industry. 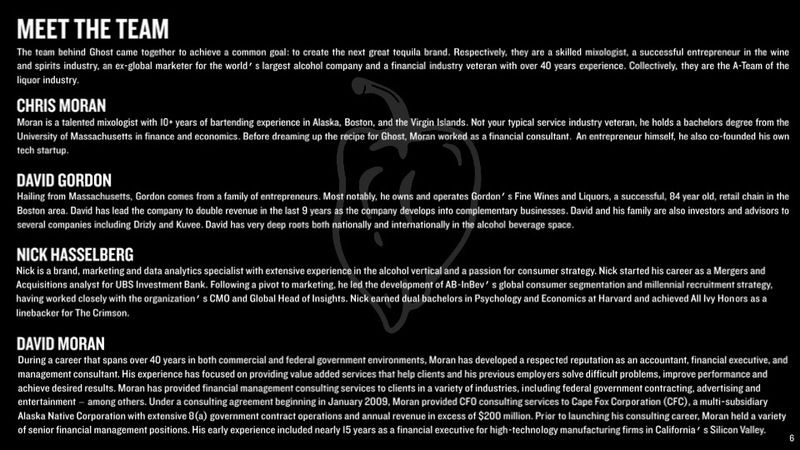 Moran is a talented mixologist with 10+ years of bartending experience in Alaska, Boston, and the Virgin Islands. 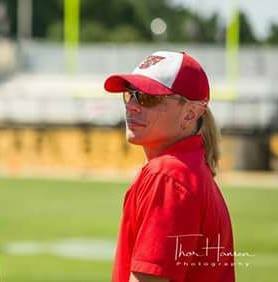 Not your typical service industry veteran, he holds a bachelors degree from the University of Massachusetts in finance and economics. Before dreaming up the recipe for Ghost, Moran worked as a financial consultant. An entrepreneur himself, he also co-founded his own tech startup. 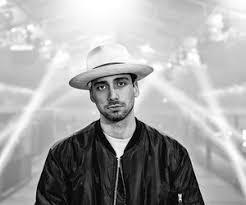 Hailing from Massachusetts, Gordon comes from a family of entrepreneurs. Most notably, he operates Gordon’s Fine Wines and Liquors, a highly successful, 85 year old, retail chain in the Boston area. 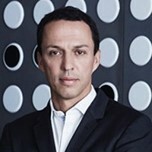 David has lead the company to double revenue in the last 10 years as the company develops into complementary businesses. David is also an investor, advisor and consultant to several companies including Drizly and Kuvee. David has very deep roots both nationally and internationally in the alcohol beverage space. 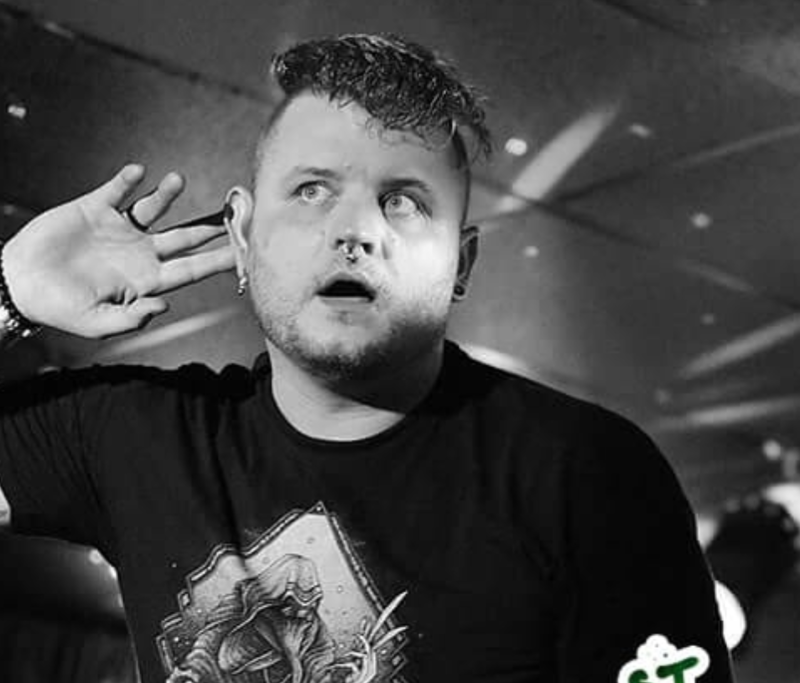 Nick is a brand, marketing and data analytics specialist with extensive experience in the alcohol vertical and a passion for consumer strategy. Nick started his career as a Mergers and Acquisitions analyst for UBS Investment Bank. Following a pivot to marketing, he led the development of AB-InBev’s global consumer segmentation and millennial recruitment strategy, having worked closely with the organization’s CMO and Global Head of Insights. Nick earned dual bachelors in Psychology and Economics at Harvard and achieved All Ivy Honors as a linebacker for The Crimson. 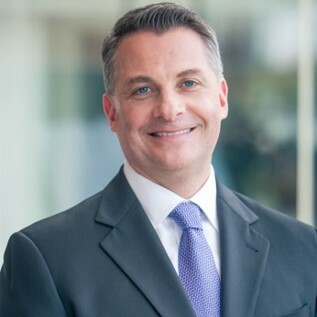 During a career that spans over 40 years in both commercial and federal government environments, Moran has developed a respected reputation as an accountant, financial executive, and management consultant. His experience has focused on providing value added services that help clients and his previous employers solve difficult problems, improve performance and achieve desired results. Moran has provided financial management consulting services to clients in a variety of industries, including federal government contracting, advertising and entertainment – among others. Under a consulting agreement beginning in January 2009, Moran provided CFO consulting services to Cape Fox Corporation (CFC), a multi-subsidiary Alaska Native Corporation with extensive 8(a) government contract operations and annual revenue in excess of $200 million. 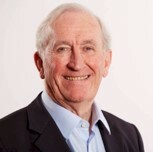 Prior to launching his consulting career, Moran held a variety of senior financial management positions. His early experience included nearly 15 years as a financial executive for high-technology manufacturing firms in California’s Silicon Valley. 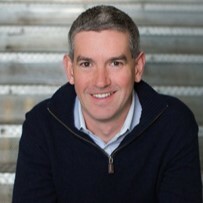 Former Chief Marketing Officer of Boston Beer Co. and Diageo N.A. This is an offering of Common Stock, under registration exemption 4(a)(6), in GT Spirits Inc, doing business as Ghost Tequila. 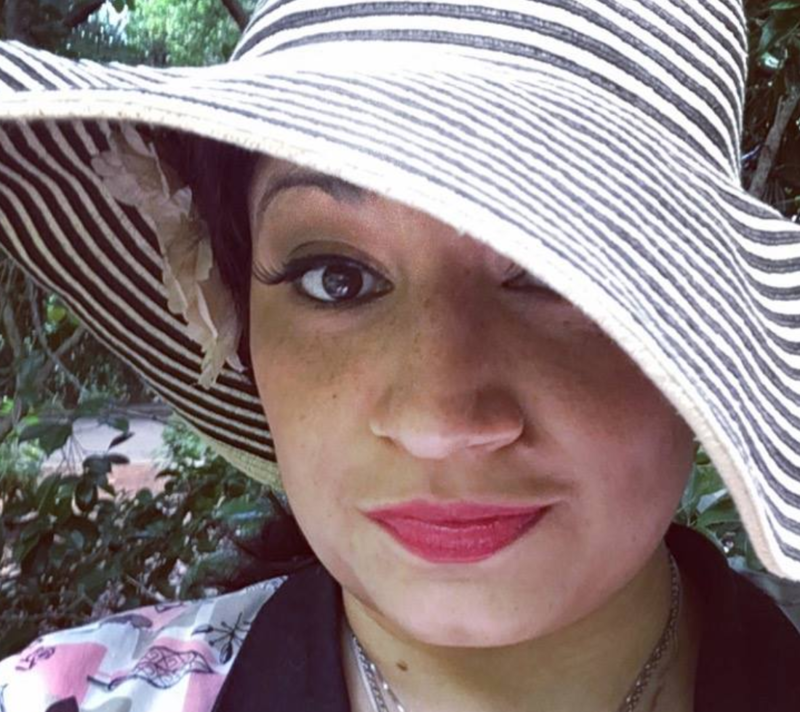 This offering must raise at least $10,000 by April 27, 2019 at 12:00pm ET. If this offering doesn’t reach its target, then your money will be refunded. 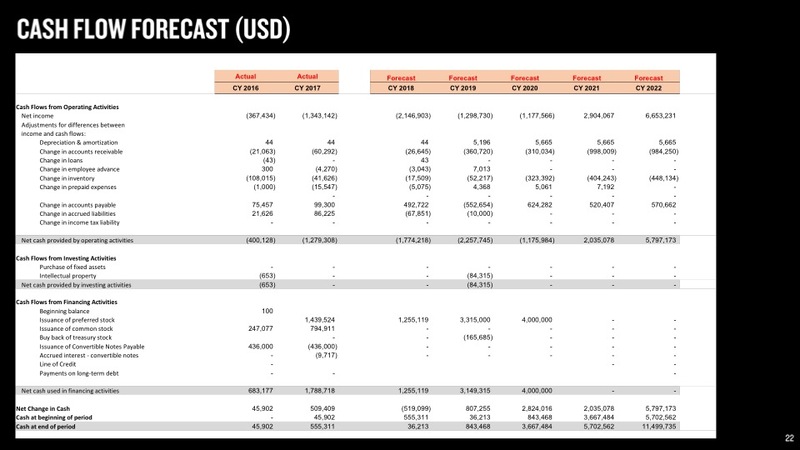 Ghost Tequila may issue additional securities to raise up to $1,000,000, the offering’s maximum. 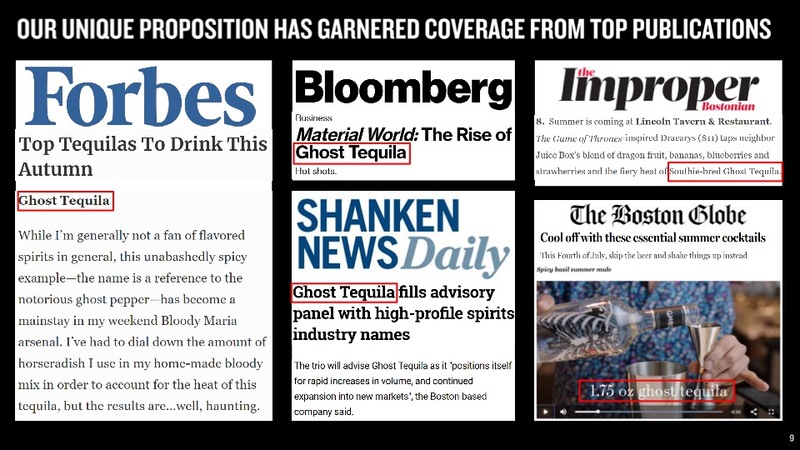 Ghost Tequila’s official name is GT Spirits Inc, so that’s the name that appears in the statements below. 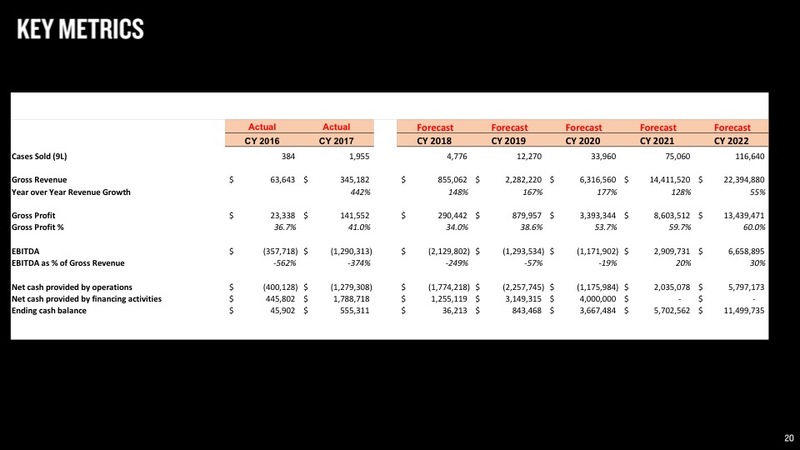 These financial statements have been reviewed by an independent Certified Public Accountant. The Offering Statement is a formal description of the company and this transaction. It’s filed with the SEC to comply with the requirements of exemption 4(a)(6) of the Securities Act of 1933. We’re also required to share links to each of the SEC filings related to this offering with investors. Proofread your comment before submitting: once it's posted, you can’t edit or delete it. For the fastest help with the web site, email help@netcapital.com instead of commenting. Be sure to understand the risks of this type of investment. No regulatory body (not the SEC, not any state regulator) has passed upon the merits of or given its approval to the securities, the terms of the offering, or the accuracy or completeness of any offering materials or information posted herein. That’s typical for Regulation CF offerings like this one. 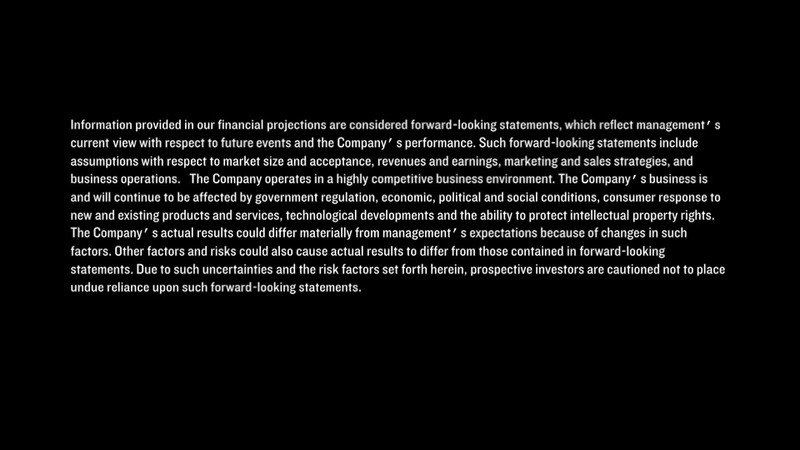 Neither Netcapital nor any of its directors, officers, employees, representatives, affiliates, or agents shall have any liability whatsoever arising from any error or incompleteness of fact or opinion in, or lack of care in the preparation or publication of, the materials and communication herein or the terms or valuation of any securities offering. The information contained herein includes forward-looking statements. 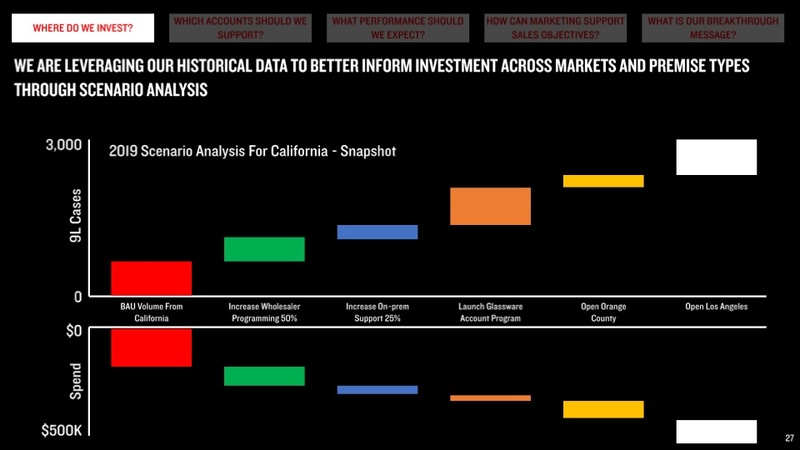 These statements relate to future events or to future financial performance, and involve known and unknown risks, uncertainties, and other factors, that may cause actual results to be materially different from any future results, levels of activity, performance, or achievements expressed or implied by these forward-looking statements. You should not place undue reliance on forward-looking statements since they involve known and unknown risks, uncertainties, and other factors, which are, in some cases, beyond the company’s control and which could, and likely will, materially affect actual results, levels of activity, performance, or achievements. Any forward-looking statement reflects the current views with respect to future events and is subject to these and other risks, uncertainties, and assumptions relating to operations, results of operations, growth strategy, and liquidity. No obligation exists to publicly update or revise these forward-looking statements for any reason, or to update the reasons actual results could differ materially from those anticipated in these forward-looking statements, even if new information becomes available in the future. Netcapital Systems, LLC (Netcapital), which is neither a funding portal nor a broker-dealer, runs this web site. Sections of the web site are used by Netcapital Funding Portal, Inc. to conduct all 4(a)(6) offerings as a funding portal registered with the United States Securities and Exchange Commission (SEC) and as a member of the Financial Industry Regulatory Authority (FINRA). Sections of the web site are used by Livingston Securities, LLC to conduct all 506(c) offerings as a broker-dealer registered with the SEC and as a member of FINRA. None of these companies provide investment advice or make investment recommendations; nothing we post to this web site should be construed as such. Use of this web site constitutes acceptance of Netcapital's Terms of Service.